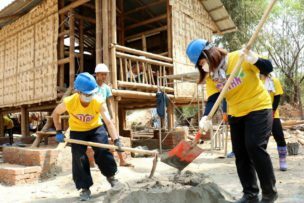 MANILA (March 13, 2018) – More than 80 volunteers have arrived in Bago region, central Myanmar, for the Asia Build as part of Habitat for Humanity’s largest youth-focused movement in the Asia-Pacific region. Over at the Pacific Build, volunteers from Australia, New Zealand and the United States will partner with a Fijian family to build a better life through adequate housing. Both builds are part of Habitat’s Young Leaders Build Campaign 2018 that aims to mobilize 4.5 million youths to volunteer, raise funds and speak out for the cause of affordable housing under the theme of PLAY LEAD SHARE. 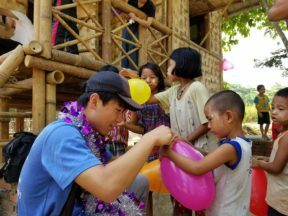 Over the next two weeks, 74 volunteers from Japan and nine volunteers from Hong Kong will work with Burmese families in Tanatpin township to build eight bamboo houses using local technology. The volunteers will also support the handover of a public sanitation facility, help raise the local awareness of water, sanitation and hygiene practices, and interact with the community through cultural activities. This year’s Habitat Young Leaders Build will culminate on April 21 with thousands of young people taking part in simultaneous activities across the Asia-Pacific region. Since the launch of the annual campaign in December 2017, initiatives such as the HYLB Leadership Academy and advocacy grants are providing leadership skills training and resources for youth supporters to build a world where everyone has a decent place to live. Habitat for Humanity Young Leaders Build brings together youths from across the Asia-Pacific region to support people and families in need of decent housing. By volunteering, fundraising, raising awareness or adding their voices in support of affordable housing, every young person can help families achieve the strength, stability and self-reliance they need to build better lives for themselves. The movement encourages youths to take the lead and motivate their peers to build homes and communities, on a Habitat build site and/or online through their social networks. Since 2012, over 8 million Habitat Young Leaders Build supporters have been mobilized, US$5.2 million funds raised and 25,635 families were supported in their journey to achieve the strength, stability and self-reliance they need to build better lives for themselves.